Whether you’re thinking of putting together a cheap Halloween costume for your company potluck or needs some ideas for Halloween costumes for your children, it’s always easy to put together a creative Halloween costume for little to no money at all. DIY Costume Ideas: A lot of people try to go the super cheap route by coming up with a DIY costume idea. There are plenty of costumes that can cost no money at all, and just involve using the clothes you already own. For example, a striped black shirt with some black pants and you can easily become a bank robber by adding some black gloves and a ski mask. 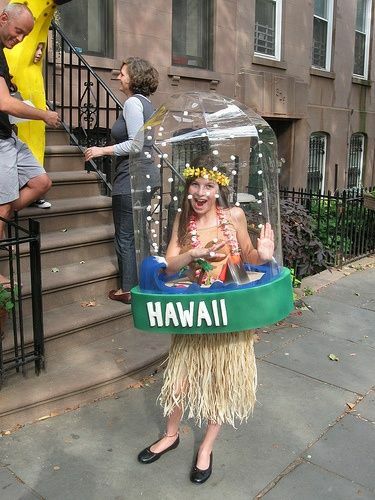 There are also many more elaborate ideas for cheap DIY Halloween costumes, like creating a snow globe out of saran wrap and using a Hawaiian skirt to make yourself the Snow Globe doll. And with the popularity of The Walking Dead, homemade zombie costumes using your own makeup have become a huge hit. To get a ton of DIY cheap costume ideas, do a search on Pinterest, something will be sure to catch your eye. Thrift stores: A lot of people always head straight to the big box costume stores to find everything they need for a costume, but the truth is these stores often charge a huge markup. If you have some patience and some time, a great place for out of the box costume ideas is your local thrift shops. You can often find the gaudiest and coolest clothes there. Many thrift stores also sell a plethora of old costumes that you can scour through. Whether buying a used white sheet for a ghost costume, or splurging on the faux fur coat to go as Cruella Deville, there are many costume opportunities to be had at the thrift shop. Walmart, Target, Costco: If you’re looking for a cheap costume but don’t have the time and patience to DIY or don’t have the creativity to go shopping at the thrift stores, but yet you still want a high-quality low-cost costume idea, then check out your local stores, such as Target, Walmart and Costco. These stores carry regular costumes that are already prepared but don’t have the outrageous prices that many of the big-box dedicated Halloween stores do. Costco especially has a good selection of children’s costumes for under $30 and many are even under $20.